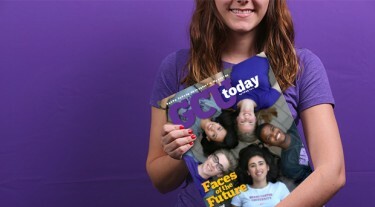 The cover story in the latest edition of GCU Today Magazine introduces you to 10 new faces on campus who are shining representatives of this fall’s incoming freshmen class. Check out the students’ stellar academics, servant qualities and deep faith and watch a cool video about their first-year expectations. The September magazine also has full coverage of a beach get-together for new GCU students from Southern California as well as a story about the University’s new engineering degrees, a feature and video about its promising soccer program and an article about a unique collaboration between GCU and Arizona hospitals to train and employ new nursing graduates. Other content: a look at where GCU students spread the Gospel during summer mission trips, a story and video about new alumnus Zenon Castro, who is moving from school janitor to teacher thanks to GCU’s s online program and a profile of alumna/future doctor Erica Wadas, plus alumni class notes.